The Byzantine vessel has been found at a depth of 82 meters, and is up to 120-125 meters long, reports the press service of Russia’s Southern Military District, as cited by the Interfax news agency. The ancient or medieval sunken ship has been spotted by members of the Rostov-Dive Club based in the Russian Black Sea city of Rostov-on-Don, which has made a number of underwater archaeological discoveries, during recent deep-water diving. The cause of the Byzantine shipwreck remains unknown for the time being. The head of the Rostov-Dive Club, Roman Dunayev, has contacted the Russian Defense Ministry and the Russian Geographical Society for organizing a joint expedition to explore the Byzantine ship whose age remains unknown. 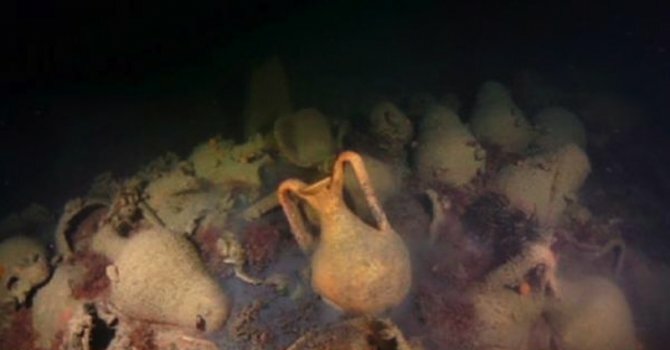 The divers have found hundreds of amphorae which were allegedly transported on the sunken vessel, and probably contained oils or wine. 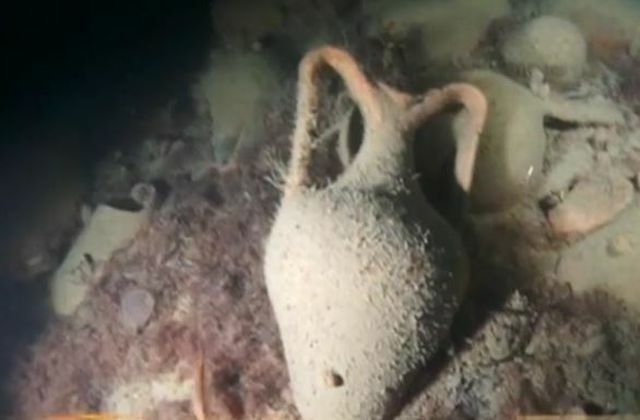 A report of the Russian TV Zvezda uploaded as a YouTube video shows the amphorae on the bottom of the Black Sea. It says that there are over 100 amphorae, most of which are intact and sealed with wax, and that the shipwreck must be at least 1,000 years old. The average size of the amphorae is about 75 cm (appr. 2.5 feet) in height, and 50 cm (app. 1.7 feet) in length. The joint expedition of the Rostov-Dive Club, the Russian Geographical Society, and the Russian Defense Ministry is set to start with the filming and mapping of the underwater archaeological site near the coast of the Crimean Peninsula before extracting the sunken Byzantine ship. The Russian underwater archaeologists and divers are not even sure whether the said location hides the remains of a single shipwrecked Byzantine vessel, or there are two sunken ships to be found there. Establishing the cause of the shipwreck will be one of their primary goals. It is possible that two commercial Byzantine vessels carrying loads of oils and/or wine collided at sea. Russian underwater archaeologist Viktor Lebedinskiy has hypothosized that the sunken Byzantine vessel came from Constantinople, and was headed to the Crimean Peninsula. 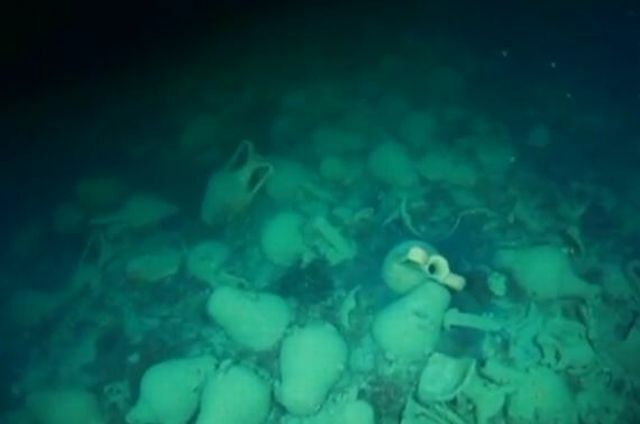 The underwater archaeological discovery off the coast of Sevastopol is said to be one of the top three in the Black Sea in the past 100 years. The Russian archaeological expedition in the Black Sea waters off Sevastopol is set to start on June 10, 2015, and might last up to several years, the report says. It will include experts from the Main Deep Water Operations Department of the Russian Ministry of Defense, the Search and Rescue Operations Department of the Russian Ministry of Defense, and the Undersea Research Center of the Russian Geographical Society. During much of the Late Antiquity and the Middle Ages, the city of Sevastopol on the Crimean Peninsula was part of the Byzantine Empire, and had constant maritime contacts with the Byzantine capital Constantinople, among other Black Sea and Mediterranean ports. In 2014, military forces of the Russian Federation under President Vladimir Putin occupied and annexed the Crimean Peninsula, which had been part of Ukraine. While the annexation of Crimea by Russia has not been recognized internationally, the Russian Federation has also established de facto control over a much larger exclusive economic zone in the Black Sea that it originally had by taking over much of Ukraine’s territorial waters surrounding Crimea. This is where the shipwrecked Byzantine vessel has been discovered. Bulgaria’s Sozopol-based Center for Underwater Archaeology at the Bulgarian Ministry of Culture and the Center for Maritime Archaeology of the University of Southampton have recently announced they are starting a joint project for exploration of the underwater archaeology of the Black Sea.